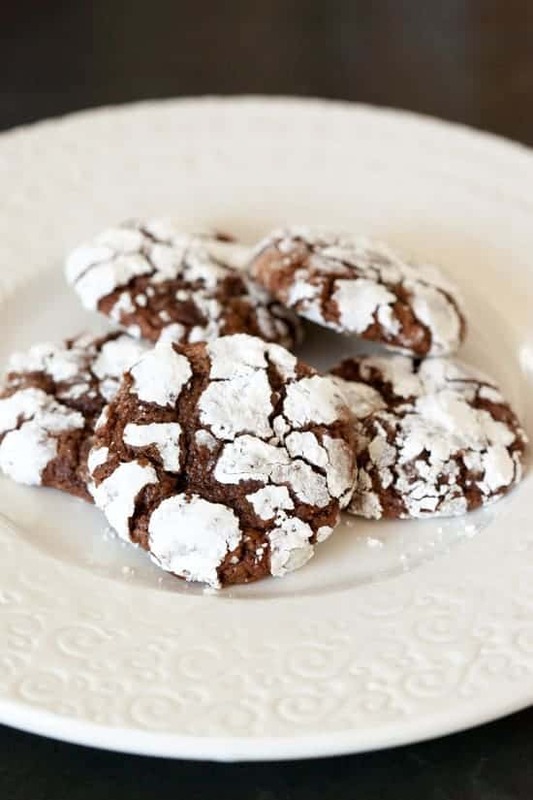 Chocolate Crackles were always included on the plates of Christmas cookies my mom put together every year for her friends, coworkers, and relatives. I’ve always loved their crackled appearance and chewy texture so I like to continue the tradition and include them on my Christmas cookie plates as well. But this year I decided to change up the plain chocolate cookie recipe a bit by adding chopped dried tart cherries and extra chocolate chips to the dough. 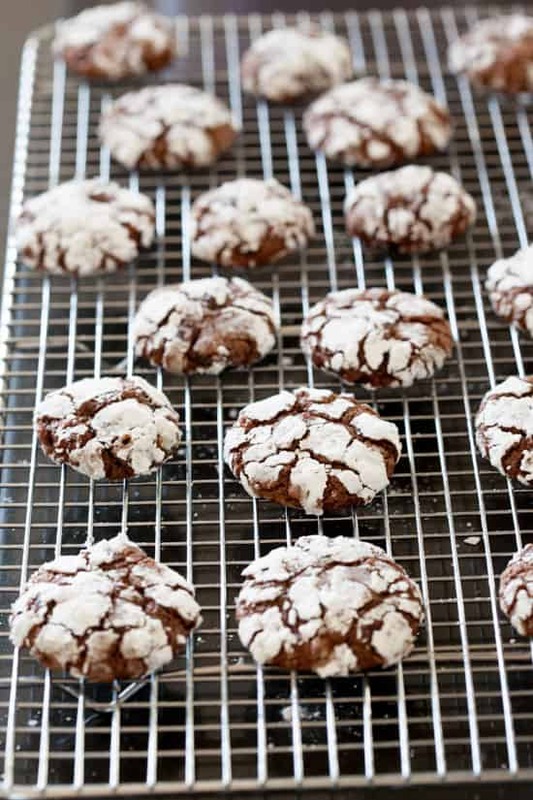 If you’re not one to mess with tradition, you can easily leave the cherries and extra chocolate chips out of the recipe and they will be a traditional chocolate crackle (also sometimes known as chocolate crinkle). The recipe was passed down from my mom but I’m not sure of the original source. It’s a very popular cookie around these parts and I’ve seen the identical recipe in local community cookbooks as well as online. I baked a few batches of these cookies a bit early this year in order to participate in the Great Food Blogger Cookie Swap, a fun blogging event where food bloggers get paired up with other food bloggers and send and receive fresh-baked cookies through the mail. I mailed out a dozen cookies to three different people and then received cookies from three others. It was a fun and delicious way to participate in the food blogging community. Another great thing about the food blogger cookie swap is that it raises money for Cookies for Kids’ Cancer, a national non-profit organization committed to funding new therapies used in the fight against pediatric cancer, which claims the lives of more children in the US than any other disease. Melt one cup chocolate chips in microwave or double boiler and let cool slightly. Combine melted chocolate with brown sugar and oil in a mixing bowl and beat until combined with a hand mixer or stand mixer. Beat in eggs then vanilla. In a separate bowl, whisk together flour, baking powder, and salt. Slowly beat flour mixture into the chocolate mixture until just combined. Stir in cherries and chocolate chips. Cover bowl and chill dough in refrigerator for about 45 minutes. 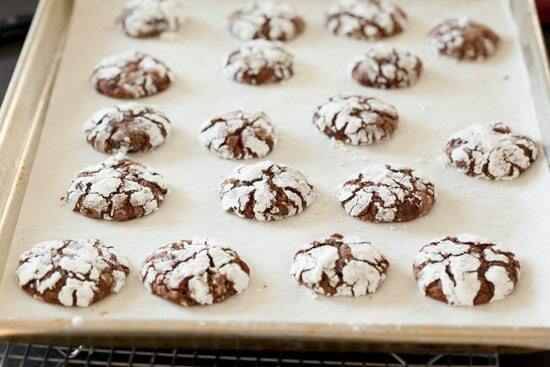 To make cookies, drop a tablespoonful of dough into a bowl of powdered sugar and roll to coat. Place on cookie sheet lined with parchment or a silicone baking mat. Bake cookies for 10-11 minutes. Let cool on baking sheet for a few minutes then transfer to wire rack to cool completely. The cherries and extra chocolate chips are optional. You could also use regular chocolate chips instead of mini chocolate chips as a stir-in. Cranberries would work in place of tart cherries. Dough can be refrigerated for longer than 45 minutes if necessary - if it's too hard to scoop easily, just let it sit at room temperature until it’s easier to work with. A cookie scoop is really useful for making cookies that are uniform in size. These are beautiful! I love the addition of the dried cherries! I liked how you mixed them up a bit with the dried cherries. I need to try this. 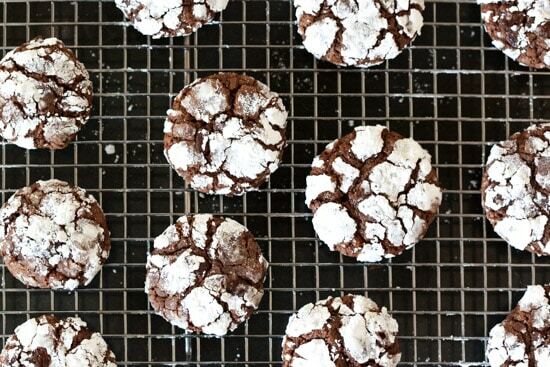 Thanks so much for including my cookie recipe in your list of "Christmas cookies around the web!" These are beautiful, thank you for the recipe!! Very impressive, why don't we try half a cup of sugar. Great post, I am inspired, thanks for your sharing, love chocolate cherries. Yeah me too love the dried cherries. Awesome recipe. Thanks for sharing. Awesome Crackles . I Simply Love them . Thank you for this Wonderful Recipe. Crispy and delicious cookie to enjoy. Awesome recipe , I love chocolate cherry crackles. I will try at home.